DJI introduced once again its pioneer drone and this is its most customizable quadcopter yet when you speak of both software and hardware. The DJI Matrice 100 gives people a relatively simple platform with the potential to do anything you can think of. This drone is not just for aerial photography, search and rescue, inspection or agriculture. It was designed to be for whatever you can think of and it is known as an easy-to-fly drone that is a perfect choice for developers and professionals who are in the process of testing sensors, processors and are in the race of innovating something new and out of the leak. The M100 offers compelling value for pilots who need a flexible and programmable flying platform but don’t want the hassle of custom-building their own. This drone has a 1 kg payload capacity and it is suitable for light-duty UHD imaging, payload and sensor-based applications. The M100 is DJI’s first fully-integrated UAV platform designed for light duty commercial applications. This is a market where 3DR’s X8+ and X8-M platforms have fared well. 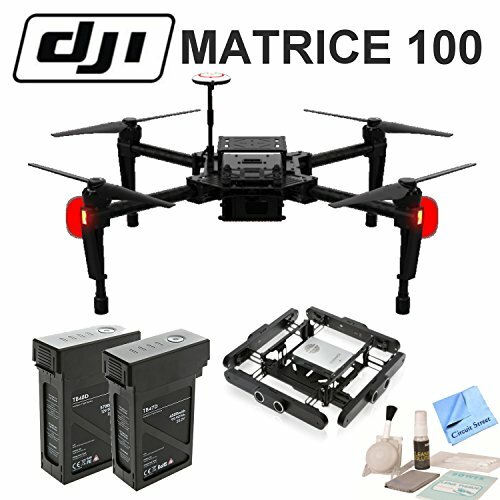 The DJI Matrice 100 comes with a kit in order to provide the user with all the necessary equipment required to fly the drone and the kit adds a little extra pounds to the overall shipping weight. The M100 is RTF fully integrated flying platform, complete with a flight controller, GPS, dedicated remote controller, propulsion system, flexible cargo bays, rechargeable battery and a great mobile app. The M100 was purpose-built to be modified by developers for specific uses and that is the most notable thing about this drone. The drone can be configured using its hardware expansion bays to carry any set of sensors or devices (up to 1000 grams) that you want to put into the sky. Developers can also build custom mobile apps and advanced flight controls for any requirement using DJI’s new SDKs. The M100’s combination of flexibility and programmability opens new doors to develop reliable and inexpensive UAV solutions for many vertical applications and the drone offers compelling value for the light duty commercial UAV operators. The only way of fully unlocking the potential of this platform is to have a software development kit (SDK). DJI now offers robust SDKs for developers to customize the M100 for commercial use. DJI currently offers two SDKs: one for interacting with the Onboard API, and another for building mobile apps. You can monitor and control your DJI Matrice 100 from any system that is wired directly to the DJI flight controller by interacting with the onboard system’s API. Autopilot apps: tell the drone how and where to fly using either visual sensors or onboard GPS to navigate. Custom flight commands: work with a single keypress: camera positioning, aerobatic maneuvers, return home flight paths (or hover in place), and more. Informatics and Avionics apps: They gather information in real time from the entire system. The Mobile App SDK makes it simple for developers to build mobile apps for specific tasks, applications and industries. Pix4D allows you to set GPS waypoints and plan your flight with extreme accuracy, then fly the route automatically and turns your DJI drone into an autonomous mapping and imaging tool for real estate, agriculture, and other commercial applications. Using your Smartphone or tablet device you can turn your DJI drone into a smart drone, with Real-Time Controls, Motion Tracking and Selectable Modes. DroneDeploy create maps in just one click, autonomous flight control, and fast cloud data-processing for your DJI drone. DroneDeploy transforms your drone into a powerful mapping machine, perfect for different industries, from agriculture to mining. The dual batteries the M100 comes equipped with further steal the show. This drone will use smart batteries similar to the Inspire 1 and these batteries are rechargeable in nature. It is because of this particular feature the drone can travel longer a distance. This enables the operator to soak in the flying experience that much more. The dual battery compartment helps the drone with a better flight time. Brace yourself: the M100 has a maximum flight time of 40 minutes, which offers greater capacity to the system as well as any additional accessories or devices that you desire to soar with. It is important to note that flight durations vary depending on flight conditions and payload. The overall flight time comes down with the addition of payload, so it would be prudent to avoid payloads while flying the drone. Also, you can get more familiar with drone batteries and how they work, so that you might choose a higher capacity battery. But remember that you mustn’t endanger the electronics of the drone. Also, the drone’s lightweight structure is definitely another reason for longer flight time. Lastly, the prevailing weather conditions are another important factor in deciding the overall flight time of the drone. DJI Guidance is a new array of positioning sensors that offers a secondary means of navigation and situational awareness that most other commercial drones do not offer. The new vision positioning system keeps the M100 out of harm’s way and is effective at altitudes of up to 20 meters (65 feet). This $999 option combines integrated visual cameras, core processor, advanced computer vision algorithms, and ultrasonic sensors into a single, integrate subsystem. The new vision positioning system scans the surrounding environment and detects all obstacles in real-time. DJI Guidance can be used to automatically avoid collisions and perform emergency maneuvers when used with a DJI flight controller. The Matrice 100 can maintain an indoor hover to within centimetres using the vision and ultrasonic sensors. Stereo algorithms provide super-high precision positioning information over any terrain when flying at high speeds. DJI Guidance works with Onboard API SDKs and DJI’s Mobile App, which means that developers can build custom apps for many industries that take advantage of Guidance’s visual and ultrasonic sensors, such as aerial imaging firms, building inspection, and utility inspection. The M100 comes with an N1 flight controller system included, so you no longer need to purchase one as is the case with other quadcopters. This highly responsive controller allows the drone to have highly stable flights, and also makes it receive your flying commands when in flight. The controller uses a rechargeable battery and has an operating range of up to 1.2 miles (2km). It comes with adjustable/assignable controls and video outputs – plus a holder to connect your mobile device. 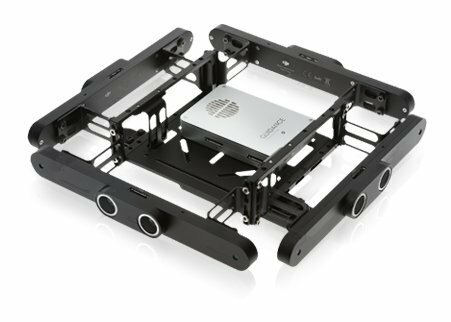 The M100 is an extremely flexible platform, with several expansion bays which permit you to combine parts, personalize the payload, as well as soar with any gadgets you would like. Expansion bays will allow you to add additional computing power, cameras, communication devices, sensors and more, which will help you to collect information while finishing complicated work at a birds-eye perspective. 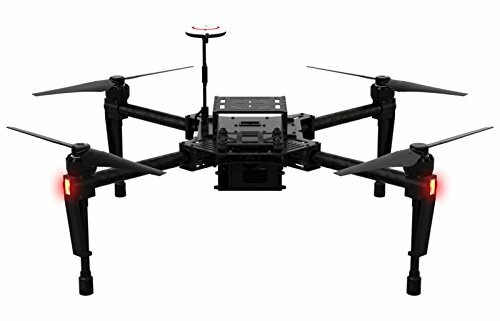 This drone will feature universal power and communication ports such as CAN bus (for connecting other DJI devices – including DJI Guidance) and UART (for connecting third party add-ons). You can move the battery as well as other sections around the construction of your Matrice 100 drone to accomplish perfect balance as well as a perfect flight adventure. Place your parts precisely where you would like them to optimize functionality and weight balancing goals and obtain the most from your platform. Modifying the arm position of every of the four arms is easy and quick and they are adjustable to fit your flight requirements. Move the arms for a 3-degree position to accomplish extended yaw torque as well as increased reaction. Spring-loaded, removable landing arms (pads) are mounted at the bottom of every arm to safeguard your DJI Matrice 100 when touchdown. These pads help protect delicate system components and get rid of the possibility of your system accidentally raising from the ground. Your Matrice 100 drone is made from lightweight, strong carbon fiber material to increase stiffness, reduce vibrations, as well as bring unparalleled dependability. Each one of the drone arms consists of DJI’s brand-new soft vibration-absorbing content that almost eliminates vibration feedback from the drone’s motors. This content also maintains your important parts stable and permits unprecedented precision. The Matrice 100 comes with an enhanced GPS position system that allows you to monitor your drone’s location instantly while allowing faster satellite exchange, more precise flight planning and position holding. The M100 comes with DJI’s Pilot app. This provides market-leading video streaming, navigation and informatics features out of the box. However, many M100 owners choose to make their own personal application using the DJI Software Development Kit. Control your gadgets, observe a real-time perspective and access a live map by just connecting in your tablet or Smartphone. The M100 uses DJI’s new E800 motors, DJI 1345s propellers and DJI E SERIES 620D ESCs, which offer you total control throughout the flight. You possess the freedom to produce the device you require with extended payload capacity and strength. If there is one drone which is waiting to fly out of the box then it has to be the DJI Matrice 100! Firstly, it is imperative that we talk about the impact of the Guidance system, because it has made the flying process much easier. With the Guidance system you will be aware of the geographical features and all kind of obstacles around your drone while it is in flight. Moreover, the Guidance vision positioning system allows the M100 to weed out information about every possible terrain and this works effortlessly even at heights of 20 meters. This feature can only be considered as an advantage and the catch here is that it can do all this without the use of any GPS. In addition to this, the anti-collision sensor on the M100 allows it to evade every kind of obstacle even when the drone is flying at a high speed. Take 12 MP photos and record stabilized 4K video from the sky using DJI’s integrated camera and 3-axis gimbal system. DJI’s revolutionary sensor kit helps your drone sense its nearby environment along with any obstacles or obstructions in real time. Integrated AV and HDMI video input interfaces support a third-party camera. The images from the camera can be transferred via the video downlink, bringing a live HD view. You can extend your flight time by flying with an additional DJI Intelligent Flight Battery. DJI Matrice 100 is just perfect to develop solutions which make the use of lidar and photogrammetry sensors, all thanks to the high-end features the drone comes equipped with. This drone is really packed with some amazing features that aim to make your flight experience a really enjoyable one. Automatic collision avoidance – The M100 comes with a collision avoidance system and this feature is what actually made the drone hit the headlines. With the help of top cameras, sensors, and a processing unit, the drone has the inbuilt ability to avoid crashes and collisions, which means that you no more need to fret about its collision with trees, cars, people, and buildings. Responsive flight controller – The N1 flight controller helps the drone in providing stable flight experience and you can even manage to receive live HD views by integrating it with DJI Lightbridge. 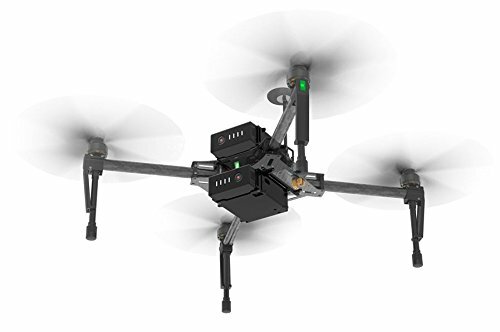 Improved propulsion system – The drone is geared up by 4 powerful brushless E800 motors. These motors give you a complete control during the flight and they also further impart the required strength to drone enabling it to carry a flexible payload. Rigid and strong body – The M100 is made up of carbon fiber. This feature imparts the drone strength at the same time making it light. Each of the arms of the drone is made from vibration pillowed material. This material helps the drone in attaining stable flight. DJI is undoubtedly a market leader when it comes to consumer drones and quadrotors. DJI is continuously in the process of bringing highly advanced and automated unmanned flying machines and since the industry is rapidly changing, the DJI Matrice 100 is their solution to this quick expansion and evolution. The drone comes equipped with a way too many advanced features and numerous drone fanatics are looking ahead to hovering this device, especially because it’s specifically designed for hacking. It definitely the best pick for professionals, research developers, and corporations who are on the lookout of an advanced drone. However, the price of this drone is not something everyone could afford it.